I prefer Otto quite frankly, but since he's not robots he's not legally allowed on this list. But his name sounds kinda like a robot name. 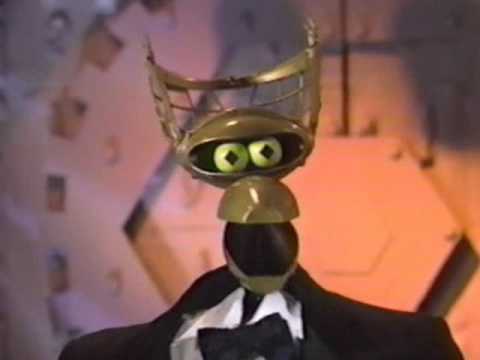 Crow is a good dude, and while he's a robot, I always kinda wondered if he's a muppet as well. Maybe a distant relative is a muppet in his family. I still need to play that game. Crow T. Robot is a robot from the TV series Mystery Science Theater 3000. When Joel Robinson was launched into space and forced to watch bad movies, he created robots to keep him company. Crow was one of them and help Joel watch and make fun of bad movies in order to help him keep his sanity. Tom Servo was built with Crow and the two acted like brothers. Sometime after Joel escaped and Mike Nelson replaced him, the gang entered the end of the universe and turned into pure energy. However, Crow returned to his corporeal form not long after and decided to hang around the ship for nearly 500 years, causing him to go a bit senile. Later, he escaped the Satilite of Love and lived with Tom and Mike in an apartment. For reasons unknown, Crow and Tom returned to the S.O.L. and are now living with new test subject Jonah Heston. Crow T. Robot is a bit more immature than Tom Servo, or at least he has fewer pretensions about his own perceived maturity than Tom. He's also the most impulsive member of the crew, often coming up with plans that he rarely thinks through. Crow is also the one in the theatre to take a joke too far, for which he is reprimanded. Later on, he became a bit more irritable and bitter and is easily confused. He also has aspirations of being a filmmaker, often with ill-conceived projects like Chocolate Jones and the Temple of Funk and his passion project Earth Vs. Soup. Out of all of the crew, Crow gets along rather well with mad scientist Pearl Forrester, who she refers to as "Art". Trivia Crow T. Robot's middle initial stands for "The". very sad about no real ones on the list. Curiosity was REALLY close to making it, as it was near the bottom of someone else's list. No ROTOR? This makes the emotionless robot angry! Good job with the list, JU. Here's mine. Most of them made it.